Intensive workshops are concentrated in five days- from Monday through Friday- for daily sessions. We meet either mornings or afternoons, depending on scheduling. Beginners will find this an excellent introduction to the wheel. You'll acquire the basic hand positions which will enable you to throw pots from two out of the three families of forms and you'll discover the different stages of production. 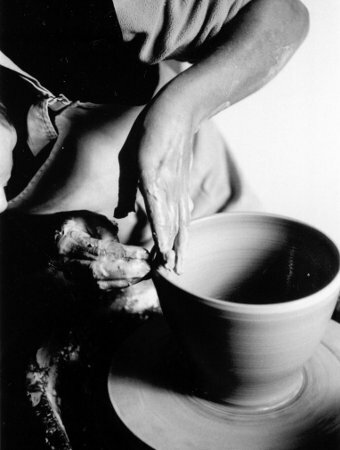 Even if you've never thrown before, you'll create 6 to 8 small pots before the end of the week. or improving your precision for throwing series. After determining your level, we'll set up a personalized program adapted to your objectives. In addition to the pleasure of being on the wheel every day, you're sure to make loads of progress. For all students : you'll have access to 12-15 colors to decorate your creations. We use unleaded glaze only and all materials are non-toxic, so you may eat and drink out of your wares. Intensive workshops are scheduled periodically from October through April. The summer months (end June through mid-August) are thoroughly devoted to workshops.